NASA photo of the Río de la Plata looking from west to east. Buenos Aires is visible on the right side near the Paraná River delta. River sediments turn the water brown to the vicinity of Montevideo, visible on the left coast. 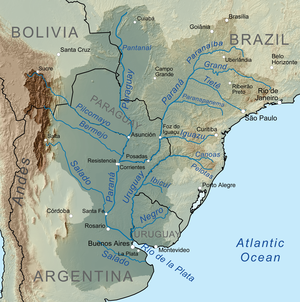 Name origin: Spanish, "river of silver"
The Río de la Plata – called River Plate in British English – is a river in Argentina. It is an estuary made from the Uruguay River and the Paraná River. These rivers are on the border between Argentina and Uruguay. It is about 290 kilometres (180 mi) long. The Río de la Plata widens from about 2 kilometres (1.2 mi) at the inner part to about 220 km (140 mi) at its mouth. Buenos Aires is on its western shore. Montevideo is on its northern shores. The Río de la Plata is home for the loggerhead sea turtle, green sea turtle, leatherback sea turtle, the rare La Plata dolphin, and many species of fish. The first naval battle of the Second World War was fought near the River Plata. The Kriegsmarine "pocket battleship" Admiral Graf Spee was engaged by the Royal Navy cruisers, HMS Exeter, Ajax and Achilles off the estuary of the River Plate in December 1939. The German ship retired up the estuary with a crippled fuel system and put into port at Montevideo. A few days later, rather than fight outgunned against the British, she was scuttled in the estuary. This engagement was part of the early Battle of the Atlantic skirmishes. ↑ 3.0 3.1 3.2 "Río de la Plata". Encyclopædia Britannica. Retrieved 11 August 2010. ↑ 4.0 4.1 Fossati, Monica; Ismael Piedra-Cueva. "Salinity Simulations of the Rio de la Plata" (PDF). International Conference on Estuaries and Coasts. Retrieved 11 August 2010. This page was last changed on 12 March 2019, at 12:03.